Accreditation is used by health care organizations across Canada and internationally as an independent measure for quality of care. When granted, the Accreditation Canada logo identifies health care organizations which have met national standards and utilize best practices in health care. In British Columbia, Assisted Living is for those who can live independently and make decisions on their own behalf, but require a supportive environment and assistance with daily tasks due to physical or functional health challenges. Complex care is another phrase used to describe “Long term care”, for Seniors who require 24/7 nursing care and support due to complex health care requirements and/or suffer from cognitive decline and memory loss. Independent Living is a retirement living option for seniors seeking to maintain their independence while having access to in-house services and amenities to enhance their current lifestyle. Long term care is for those Seniors who can no longer live safely or independently at home due to complex health care requirements and/or suffer from cognitive decline and memory loss. Long term care residences provide full-time daily living and nursing care and may offer subsidized, private-pay or a mixture of each at any individual location. Private pay refers to beds or suites that are paid fully by the resident, without government support or subsidies. Private pay suites can range from independent living to assisted/supportive living and long term care. Retirement living is another term used to describe “Independent Living”, for seniors seeking to maintain their independence while having access to in-house services and amenities to enhance their current lifestyle. In Alberta, supportive living is for those who can live somewhat independently. Some can make their own decisions and some have legal decision makers to make decisions on their behalf. Supportive living is for residents who require a supportive environment and assistance with daily tasks due to physical or functional health challenges. There are several types of “Designated Supportive Living” in Alberta including DSL3, DSL4 and DSL4 Secure. Subsidized care refers to rooms or beds that are partially funded by the government and partially funded by the resident in both BC and Alberta. How do I know what kind of Seniors Residence is right for me? Park Place offers multiple care options for seniors ranging from independent retirement living to full complex long term care. For those who require a little extra support, assisted and supportive care residences are also available. 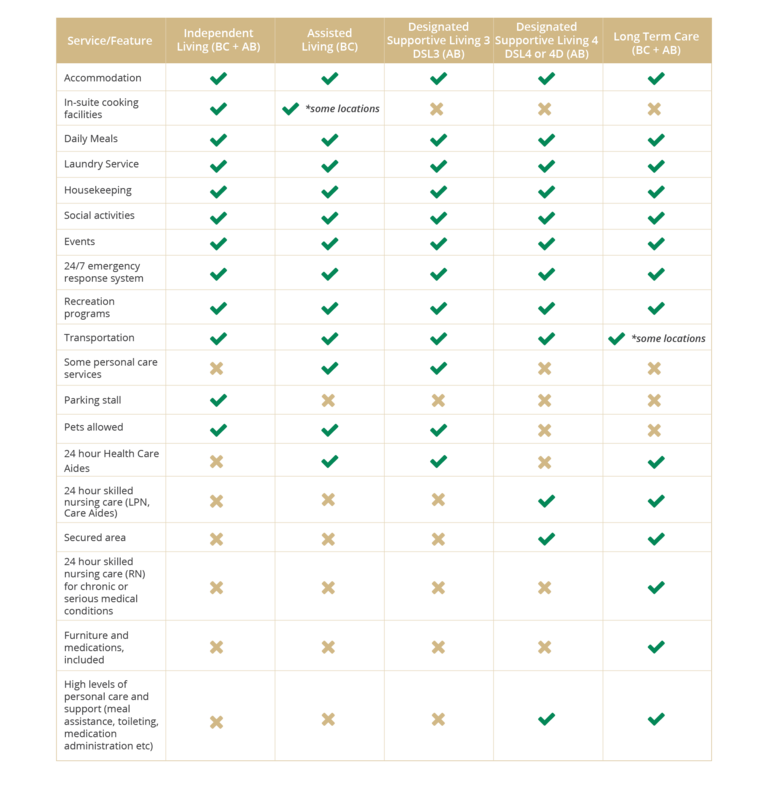 To help guide you in the right direction, take our short care options survey or download our comprehensive care comparison chart. What is the difference between “subsidized” and “private pay”? Subsidized rooms or beds are those partially funded by the government and partially funded by the resident. Private pay suites are fully paid for by the resident. Subsidized care options vary between provinces, for more information on how to apply visit our Subsidized care page. Are meals included at all Residences? Most Park Place residences offer inclusive meal plans at every care level. Check the individual locations for more information or contact your local Park Place Residence direct for more information. What does it mean when a residence is “accredited”? Accreditation is used by health care organizations across Canada and internationally as an independent measure for quality of care of long term and complex care residences. When granted, the Accreditation Canada logo identifies health care organizations which have met national standards and utilize best practices in health care. To learn more, visit our accreditation page. Are small pets allowed at Park Place Residences? Small pets are welcome at most Independent Living Residences and visiting pets at remaining care locations provided they are leashed and have up to date shots. Please check with your individual Park Place location for rules and restrictions. All of Park Place’s Long Term Care locations are fully furnished, however residents are encouraged to bring their own mementos and personal effects. Independent retirement living locations are more condo-style living and not furnished. Some assisted and supportive living residences are furnished, please check with your individual location. As integral to our foundation as our commitment to enriching the lives of seniors, our “Resident’s Day” philosophy is our promise that you will be cared for as an individual and will maintain your right to a voice and a choice in your ongoing care. For more information, visit our Resident’s Day page. Are there social/leisure activities at all Park Place Residences? Most Park Place locations offer full social calendars and activities for residents as well as organized events for family and friends. Visit your local Park Place location page to download the latest upcoming calendar of events each month. What is the Resident/Family Council? At Park Place’s long term care residences the Resident/Family Council are a group of people that may include residents, and family members, and friends of residents living in the Home. The group organize themselves to meet regularly to support each other, share information and educational resources. They also raise concerns or issues encountered in the Home, work pro-actively with Care Home staff to resolve any concerns and advocate for our residents with a view to improve the overall quality of the resident’s experience. These Councils also act as a liaison between the residents and administration. What’s the difference between “Supportive Living” and “Assisted Living”? Designated as Assisted Living in British Columbia and Supportive Living in Alberta, each are one in the same depending on your location. Assisted and Supportive Living residents are often active seniors who can live independently and make decisions on their own behalf, but require a supportive environment and assistance with daily tasks due to physical or functional health challenges. In Alberta there are several levels of “Designated Supportive Living” including DSL3, DSL4 and DSL4 Secure. For further resources, see our subsidized care page. I’m interested in applying for a job at a Park Place Residence. How do I start the process? All of our current job opportunities are listed on the careers and volunteer page. View the job description and email your resume/CV by selecting the “apply now” button.